Semi permanent fillers allow a long-lasting but non-permanent result which allows you to change your look over time. All treatments can be applied as one or combined as you wish for an individual and natural look. Explore the interactive diagram for more information. The shape of the lips can be enhanced to achieve the appearance you desire- more definition in the cupids bow, more defined edges, fuller lips, broader smile… by using knowledge of beautiful anatomy and artistic flare, you can subtly or dramatically enhance the mouth area as you wish. All patients are different, and all lips need a tailored approach. usually treated with botulinum toxin injections, to smooth the forehead and reduce the appearance of creases in the skin. Prices start from £295 for 3 areas. Usually treated with Botulinum toxin injections around the eye, to prevent the fine lines to the side of the eye and cheek, that appear when smiling. 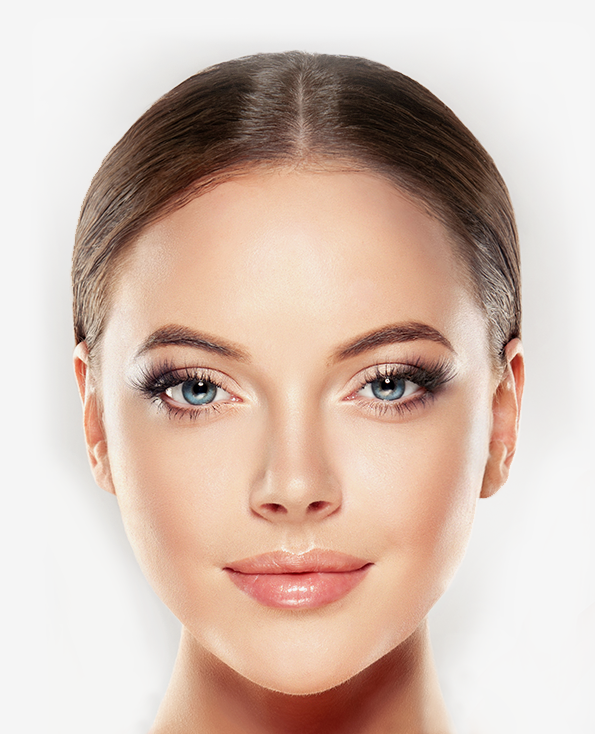 Botulinum toxin can be used to help raise the eyebrows, opening the eye area, to make the eyes look refreshed, reduce hooding of the upper eyelid and add an arch to the eyebrow. Botulinum toxin can be used to prevent and soften the wrinkle in the sides and bridge of the nose. The appearance of hollowed dark shadows under the eyes can look like ‘eye bags’ and can be filled using soft dermal filler via a fine cannula to prevent shadows and reduce the appearance of tired eyes. ‘High cheek bones' can be created or cheeks given more volume or shape to gently lift the face as it starts to sag. This creates a youthful ‘triangle of youth’ subtly refreshing the face. Prices start from £340 for soft volume, or £680 for firm cheek bone recontouring. Firm dermal fillers can be used to give a ‘non-surgical’ nose job- to hide bumps and smooth out irregularities. The lines from the nose to the mouth corners can be smoothed with dermal filler or lifted by dermal fillers in the mid face (cheeks, temples etc). The fine lines around the mouth can be filled with dermal filler to smooth the lips, and prevent lip stick bleeding. Saggy jaw lines and jowls can be smoothed out using dermal fillers. Chins can be made more prominent or symmetrical using dermal fillers. The can improve a small chin, even up a face or elongate the face if it is short and square. Botulinum toxin injections help to reduce the appearance of saggy jowls. Botulinum injections can be used to treat ‘stringy’ ‘turkey necks’. Also known as hyperhydrosis, Botulinum toxin injections can be used to give up to 9 months reduction in sweating in the armpits or hands. Arm pits start from £500. The lines from the corner of the mouth down to the jowls or chin. These can be lifted with Botulinum toxin injections or filled or lifted with dermal fillers. Botulinum toxin injections can be used to prevent the upper lip from raising too high, reducing the amount of gum displayed when smiling, for those who show more gum than they would like. Botulinum toxin injections in the masseter muscles prevent clenching of the teeth which can cause tooth wear, muscle pain and headaches. This also slims these muscles if they are over developed and give a square jaw line. Crows feet are treated using Botulinum toxin injections, to smooth the fine lines to the side of the eyes and down the cheeks, which appear when smiling.